Did Ernie Wise really make the first mobile phone call in the UK? Did Isaac Newton invent the cat flap? Is a smurf really three apples tall? 'Pub facts' are the improbable, bizarre and yet somehow convincing claims that are often wheeled out by armchair scientists, amateur lawyers and pub historians. They'll tell you, without a shadow of a doubt, that you can get tonsillitis even if you've had your tonsils removed; that it's illegal to drive in bare feet; and that some bloke had hiccups for 68 years. But is it fact or fabrication? 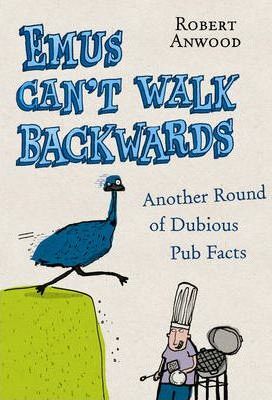 "Emus Can't Walk Backwards" will help you stride confidently through the most treacherous trivia minefield, while providing definitive answers to life's most pressing concerns. Did Johnny Cash become addicted to painkillers after being attacked by an ostrich? Do ants ever sleep? Are mushrooms and toadstools the same thing? Refreshingly cynical and engagingly informative, this hilarious follow-up to "Bears Can't Run Downhill" clears up the confusion by revealing the outright lies, the muddled misunderstandings and - just occasionally - the astonishing truth. "This should settle a few pub arguments once and for all"
Robert Anwood lives in London, where his hobbies include going to the pub and arguing. Writing under the questionable pseudonym of Siegfried Baboon, he also runs the Truck Driver's Gear Change Hall of Shame (www.gearchange.org), a website that musically documents the world's most unnecessary key changes. He is the author of Bears Can't Run Downhill (2006).